In the weekend of May 2o-22, Stepteam Twente organizes an IKSA Eurocup again. For a moment it seemed that this event was not about to happen in the Netherlands this year, which our footbike team would regret very much. But in the end, after a few phone calls and e-mails, we found out that in the weekend of May 20-22 our favorite footbike racing tracks were available for us. The weekend will have an early start on Friday afternoon at 17:00 with a Pasta Party, offered to you by our team sponsor Kickbike. This party will take place near the building of our sponsor in Hengelo (Overijssel). From 20:30 the sleeping accommodation at the site of the youth organization ‘Jong Nederland’ in the village of De Lutte, will be open. The space at this dormitory is limited, so please register early. You need to bring your own air-bed and sleepingbag. On Saturday there will be the sprint and relay events on the skeeler rink in the village of Losser. We will start with the sprint qualifications. After the qualifications the heats for the quarterfinals, semi-finals and the final will take place. The relay event will take place on the same skeeler rink. 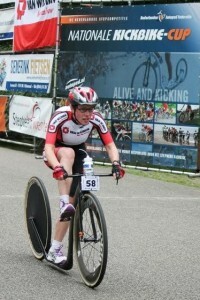 On Sunday morning there will be an endurance race of about 40 km on the OWC cycle track near the town of Oldenzaal. Both the Losser skeeler rink and the Oldenzaal cycle track are well known by footbikers who participated in previous editions of Eurocups organized by our team. Cadets will ride 9 laps of 2300 meter and the pupils will ride 4 laps. During and after the Sunday awards ceremony soup and sandwiches will be provided at the OWC canteen against cash payment.